Hello, everyone. I hope it's sunny and spring-like wherever you are. I hope you are feeling alive, positive and motivated. That's how we're feeling at Palladium Books. I know I had to keep things short in the last Weekly Update because of the Creators Conference (which was awesome), so I'm making up for it with a lot of news this week. UPDATE: The Rifter® #54 – shipped this week. Subscriber copies went out on April 12. Distributor copies went out on April 13. PR copies went out today. This is another great issue with a wealth of fun information. A Heroes Unlimited™ adventure, Palladium Fantasy RPG® monsters and races, the Rifts® city of New Chillicothe, a Nightbane® story and the final chapter of The Hammer of the Forge, plus news and other good stuff. UPDATE: Rifts® Thundercloud Galaxy™ – Ships April 25. The book is at the printer. I approved the pre-press digital proof on Monday. Tuesday the printer contacted me to confirm the ship date of Monday, April 25. Roughly 30 freelancers got to see Thundercloud Galaxy™ over the weekend (our proofreader copy is dog-eared) and EVERYBODY loved it. We heard comments like, "it's great," "it's not what I expected, it is awesome," and which characters people wanted to play. Carmen Bellaire is dying to play the Shing™, the Trensik Mercenaries™ was another favorite. One of my faves is the Kasaro™ cannibals. People loved the new info on the Dominators™ and Gene-Tech™ too, and I can't even begin to tell you the fun everyone had with theThunder Duck™. The Thundercloud Galaxy™ is a playground. Your playground. An environment filled with the bizarre and amazing, and chock-full of adventure. But don't take my word for it. Take a peek at the Thundercloud Galaxy™ Sneak Preview. 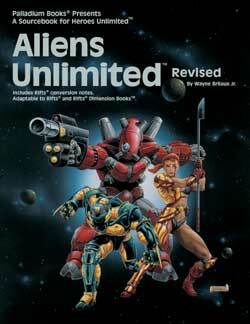 Just a reminder, the Aliens Unlimited™and Aliens Unlimited™ Galaxy Guide books also offer many alien races that can be dropped into any space campaign. They are S.D.C. races, which fits for the Three Galaxies, and some can be easily adjusted for M.D.C., such as beings made of silicon or plant matter. There are Rifts® conversion notes included in both books. UPDATE: Rifts® Thundercloud Galaxy™ Sneak Preview. The preview is available as a free PDF download from DriveThruRPG.com. It is easy to create a free account and only takes a couple of minutes. The preview shows the Trensik Mercenaries R.C.C. as well as a brief overview piece, a map of the galaxy and the Contents pages. The free Armageddon™ Unlimited Sneak Preview is also available. Remember, DriveThruRPG.com is a good resource for getting The Rifter® numbers #1-48 and to fill in your RPG library with first edition copies of Rifts®, Palladium Fantasy®, Heroes Unlimited™, and other game lines as well as books such as Nightbane® Book Four: Shadows of Light™ and both versions of the The Mechanoids® RPG (1985) and The Collected Mechanoid Invasion® Trilogy (1981-1983). UPDATE: Rifts® Vampire Kingdoms. I've already started prep work for this title. I've reviewed new artwork and fielded a couple of emails on the subject from contributors. I may work on it and the Rifts® Vampires Sourcebook simultaneously. UPDATE: Robotech® New Generation™ Sourcebook. I plan to switch from vampires to Invid and power armor, so I can get this title into production and assign artwork. UPDATE: Rifts® Megaverse® in Flames has also been put into pre-production mode. The cover was assigned last week and I'm looking to start assigning art for it in the next week or two. UPDATE: Rifts® Movie Option. It looks like the film option is going to be renewed for one more year by Disney for development by JB Films. Fingers crossed that a Rifts® movie is in our future. UPDATE: Alex. After much discussion and numerous quotes on parts of the work, Alex and family have decided to repair the house that caught fire rather than rent or buy a new home. It will be less expensive in the long run, and preserves memories of the home. This is only possible because some friends have stepped in to do the work on the cheap (and it's still costing plenty!). Our thanks to those good souls. We have everything in place and the work should begin this weekend. With any luck, the place will be ready to inhabit within 5-8 weeks. There is a lot to be done, but everyone is excited. BACK IN PRINT: Two popular Rifts® titles will be ready to ship the same time as Rifts® Dimension Book™ 14: Thundercloud Galaxy™. See full descriptions below. Palladium Creators Conference, a complete success. Last weekend, Palladium Books hosted a Creators Conference. Freelance writers and artists from across the United States and Canada attended. 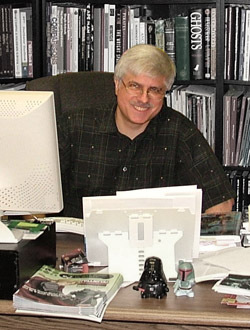 The goal: To take Palladium Books to the next level. We are done treading water in the aftermath of the Crisis of Treachery. For a few months now, I have been putting things in motion to make Palladium Books strong again. The Creators Conference was one big step in that direction. It was part seminars and workshops and part brainstorming session. We discussed current projects, new projects, future goals, and processes for getting new releases out on time. The excitement was electric. The event was everything I hoped it would be. It has helped to focus and center us as a team. We have our goals set, projects (new and old) lined up and priorities straight. With a little luck, hard work and determination, you'll be seeing new releases coming from Palladium Books every single month. Titles you've been waiting for and new titles that will surprise and please you. All of them will be top quality and inflame your imaginations. What did we talk about at the Conference? Everything. The rocket science behind making role-playing games and sourcebooks, writing, storytelling, marketing, and finding ways to unleash our imaginations in new ways in new mediums. We talked about current projects and plotted new ones. We dared to consider all possibilities and challenged what we know to find new ways to create fun. There was a bit of role-playing, and we talked, shouted, laughed and goofed around. I took my basketball machine, foozeball table and Star Trek pinball machine out of mothballs so people could play in between and have some fun. There was a real synergy – a connection and sense of purpose. No subject was off the table. Everybody shared from the heart. Everybody showed passion for their craft and for Palladium. The ideas ran unchecked. The energy level was high. Throughout the Conference I could see the lightbulbs going on above people's heads as ideas clicked over and over again. We talked for hours. I think everyone walked away with their heads filled with information and ideas, and their hearts pumping adrenaline. I know mine was. Good things shall come from the Creators Conference. More than you may imagine possible. Murmurs from the Megaverse®. I'll be posting more information, thoughts and information about the Creators Conference in Murmurs from the Megaverse®. You may be seeing more Murmurs from other Palladium staff and creators as well. More positive movement. The new Palladium website should go live by the end of April. The new look and function of Palladium's website is just one of many things we are doing to promote Palladium Books and increase our presence. We'll also be doing more with Facebook, Twitter and other social media. UPDATE: Online sales. I'm happy to report online sales have picked up this week. They aren't stellar, but better than the last few weeks. We're getting lots of pre-orders for Rifts® Thundercloud Galaxy™ and the two Rifts® Vampire titles, which are good to see. The momentum is building. UPDATE: Birthday celebrations. Man, oh man, we've been so busy, I only got my birthday list done this week. We'll be celebrating Julius' and my birthdays on April 22 (they were April 7 and April 2, respectively). Wayne's is only a week later. Before the Creators Conference started, Carl Gleba gave me an awesome painted miniature of a Splugorth. Wow, it is gorgeous! Um . . . er . . . you know what I mean, as gorgeous as a Splugorth Intelligence can be. Anyway, I love it. Thank you, Carl. Keep those imaginations burning bright. Ours are working overtime. This is another landmark issue of The Rifter® filled with epic source material, exotic places, strange critters, adventure settings, good stories and ideas. The Final Chapter of The Hammer of the Forge™, by James M.G. Cannon. At last, the pulse-pounding conclusion of this epic tale. Will it be a happy ending or a tragic one? We guess you'll have to wait and find out. Dawn of a New Era, Part Two, by Corey Livermore. The conclusion to the adventure in a setting for Heroes Unlimited™ in which mutants and aliens are being forced to "register" with global governments, or else. A Megaversal™ Menagerie, by Aaron Corley. A collection of sentient beings and strange animals from the Palladium Fantasy® world and across the Megaverse®. Dark Day™ Chronicles, Volume 2. A Nightbane® short story by Jeremy Hutchins. $11.95 retail – 96 pages – Cat. No. 154. Available now.